Slightly less familiar, perhaps, is schiacciata, a flattened bread which takes its name from the Italian ‘schiacciare’, to flatten or to crush. In Sicily they stuff their schiacciata with potatoes, spinach, meat or cheese while in Tuscany it’s an altogether more basic affair, not unlike a focaccia. The topping can be as simple as a sprinkling of salt or scattering of tomatoes, although they also make an unusual, and utterly delicious, version with seeded black wine grapes, rosemary and a little scattering of sugar to celebrate the Tuscan grape harvest. I’ve mentioned before that my parents have a house in Tuscany, and every summer of my childhood would be spent up there in the mountains drinking in the incredible air, basking in the sunshine and enjoying the wonderful local produce. Being something of a bread monster, I used to love the fact that it featured at every meal in Italy, whether grilled as bruschetta, in a basket on the side to mop up sauces or even as the main event in dishes such as panzanella, however I’d always long for a little more variety in the dough itself. If you’re not familiar with Tuscan bread, it might come as quite a surprise to learn that the dough contains no salt. Reasons for this are not entirely clear, although some sources suggest that it is the result an ancient quibble over hefty salt taxes which the Tuscans didn’t want to pay. Whatever the reason, the result is that the bread served in homes and restaurants around the region is pale-crusted with a short shelf life and no real depth of flavour. Perfect for grilling or eating with salty side dishes, but often disappointingly bland if you attempt to eat it on its own. For our everyday bread needs, my Mum would buy standard Tuscan loaves to eat, but every so often we’d be allowed schiacciata as a special treat. The flattened, golden bread would be taken from behind the counter in our little local deli, packaged up and passed into our expectant hands, tiny circles of grease spreading slowly across the paper where it met a pocket of oil on the surface of the bread. The schiacciata itself was thin with a slightly chewy crust, the best bit being the layer where soft centre met the salty, ever-so-slightly greasy outer edge. The perfect accompaniment to milky mozzarella and thick-sliced plum tomatoes (if it ever made it from the shop to our house in one piece). The recipe below is a variation on schiacciata which I found in the Bourke Street Bakery book. If you love baking, and don’t own a copy, I urge you to go out and buy one now. Written by the bakery’s founders, every page is full of their passion with wonderful recipes, photos that are stunning in their simplicity and huge amounts of insight and advice. This recipe uses their basic olive oil dough which is made with a day old ferment and can be adapted into any of the Italian breads mentioned above (panini, grissini, flatbreads, focaccia or pizza). 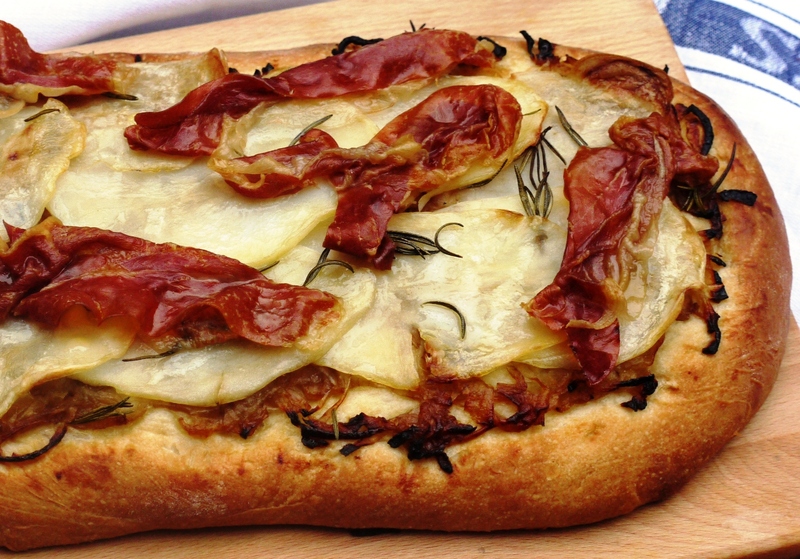 The flattened dough is topped with sticky caramelized onion, a layer of the thinnest sliced potato possible, curls of salty prosciutto and sprigs of rosemary before being drizzled in oil and baked in a very hot oven. When it emerges the edges are golden brown and the potato soft, marrying beautifully with the melting onion and contrasting with the crispy pieces of prosciutto. A little more extravagant than those simple salt-studded schiaccate of my childhood, but none the worse for it. This kind of bread could be a meal in itself. Cut into wedges it’s also wonderful with roast chicken and a crisp green salad, best enjoyed outside, in the sunshine, with a glass of something cold. But if you’re looking out the window at howling winds and pouring rain and wondering when that summer’s day will ever come, don’t worry – just the taste of this bread alone is enough to transport you to a sun drenched Tuscan terrace, if only for a moment. Put all the ingredients in a bowl and mix together to combine (about 5 minutes) until the dough is smooth and elastic. Transfer to an oiled container and rest overnight in the fridge. Put the flour and yeast in a large bowl then add the warm water. Mix until well combined then add the oil, milk and salt. Knead on a floured worksurface for around 10 minutes then leave the dough to rest (5 – 10 minutes). Add the ferment, then knead for a further 5 – 10 minutes or until smooth and silky. Put the dough in a clean oiled bowl, cover with cling film and leave to prove for one and a half hours. Every half hour (so twice in the proving process), you will need to knock back the dough. To do this, turn the dough onto a lightly floured surface and press out into a rectangle about 3cm thick. Fold one third of the dough back over itself, then repeat with the remaining third. Turn the dough ninety degrees, repeat the process then return to the oiled bowl. After one and a half hours, your dough is ready for the schiacciata recipe. Use a mandolin or very sharp knife to cut your potatoes into long thin slices about 2mm thick. Simmer the potato slices in a saucepan of water for about 5 minutes until almost tender, then plunge into cold water to stop them cooking. Set aside. Divide your 400g dough into two equal sized pieces. Roll each portion into a rectangle approx. 30cm long x 15cm wide and about 5mm thick. Carefully transfer to a greased, lined baking sheet and set aside to prove for 10 minutes. Preheat your oven to 220 degrees C. Spread a thin layer of onions over each loaf, leaving a small border around the edge. Arrange your potato slices on top, overlapping slightly then lay on the prosciutto slices. Sprinkle with rosemary and a few crystals of sea salt (remember that the prosciutto is quite salty) then drizzle with olive oil. Set aside to prove for a final ten minutes. Reduce the oven temperature to 200 degrees C and bake your loaves for 20 – 25 minutes until the edges are golden and the base and prosciutto nice and crisp. I love breads like this; great post. This looks delicious. I love the Bourke Street Bakery Cookbook and this is a great reminder that I must cook from it more often! Oh to have parents with a place in Tuscany-that would be heaven! And I had no idea that Tuscan loaves had no salt in them! I love the flavours you used on both these loaves, particularly the combination of potato and rosemary which I love on bread. My brother used to work in a bakery that made the best schiacciata and I loved it but I haven’t had it for years and years. I must make my own! While society may be increasingly carbophobic, I *adore* the combination of potatoes and bread. This looks wonderful! Tandy – I know, me too! Lorraine – it is complete heaven – going there in July and cannot wait! Kathryn – you must, schiacciata is so good! Beautiful and so delicious-sounding. I’ve never tried schiacciata but I can’t imagine there is anything NOT to like about it. I also love the idea of a potato topping – have been meaning to try it with pizza/focaccia for ages but have never got round to it. I love this bread as do I love Italy and Tuscany in particular! You were so lucky to be able to spend so much time in Tuscany, it is so beautiful! Yum, you made me hungry! Love the potato and prosciutto combinations, true comfort flavors! yummy, just the kind of food i love to eat. That looks so good! I’ve never heard of this bread and now it’s on my list to try…I need more hours in the day! Mmmm…. I agree with Kathryn about the flavours and especially potato and rosemary (and plenty of salt of course!!). Its obviously Atkins worst nightmare but I adore potatoes on bread. Roasted potato pizza is one of my favourites! I never realised how vital salt is to a loaf til I went to Tuscany. It does add a certain something to bread you don’t realise til it’s missing! Elly – potato on bread is delicious. I first had it in Australia – purple potatoes on pizza – but pretty much any combination works really well. Regula – Tuscany is just such a wonderful place – can’t wait for summer when I get to spend 2 weeks there! Ilva – salt + carbs = comfort food heaven. Miss South – salt is so important in bread, although I am strangely partial to an unsalted Tuscan loaf every so often . . .
Daisy – it’s not difficult, I promise! 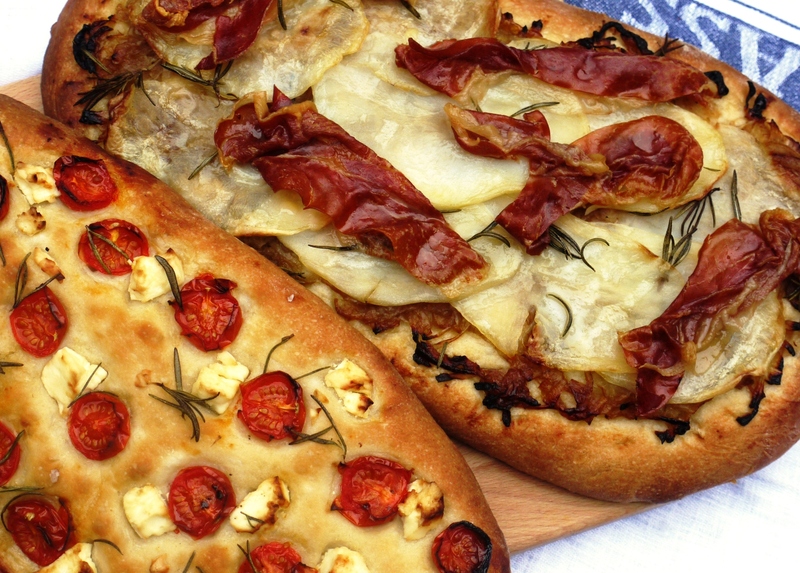 Although if you want an easier flat bread recipe, try my recipe for focaccia. Oh I’m so jealous you get to spend 2 weeks there 🙂 that’s fantastic ~ You’ve gotta share with us all the beautiful scenery and bread you eat! 😮 How did I not know that your parents have a house in Tuscany and that you spent your summers growing up there?! How incredible! I am so jealous. Really–I just promised myself that I will have a summer house in Tuscany where my kids will spend their summers. But to the bread, this looks incredible. I don’t think I could ever choose a favorite Italian bread but geesh I am itching to try this out now. Love the flavors you combined. Wow! Those look great. And I love the flavor combinations! Yes, please. I haven’t tried this yet – but it looks amazing, I can’t wait! I was just wondering though (having never made bread of any type before) why do you need to turn the oven on to 220 degrees C when preparing to cook the schiacciata and then turn it down to 200 before baking? Couldn’t you just preheat to 200? Apologies if this is a ridiculous question from a novice! 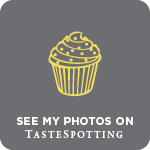 Amateur Food Ramblings – I was worried the pics looked a little bit brown (I snapped it in the morning before taking in for a work breakfast!) but I guess they are quite beautiful in an earthy sort of a way! Laura – it’s such an inspiration, can’t wait to go back this summer! 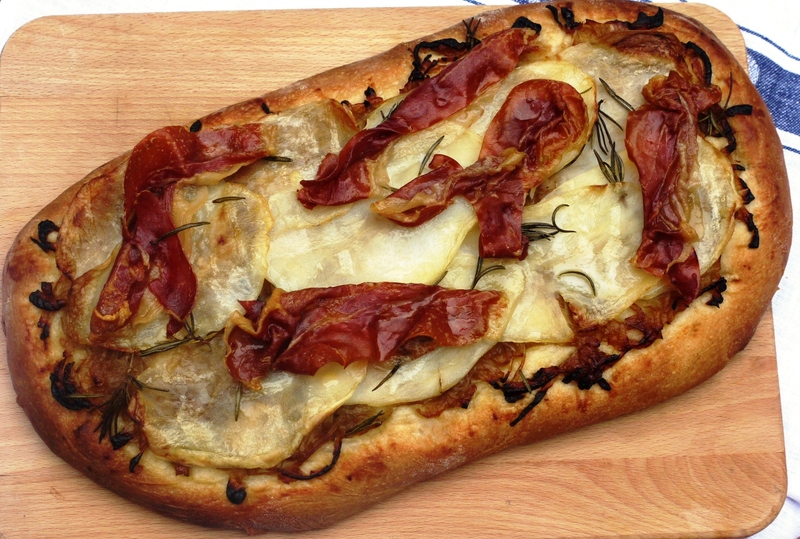 Lisa – this is definitely a pimped up version of your average focaccia! Ellie – not ridiculous at all 🙂 When you open the oven at home it’s quite easy to lose a little heat while you’re putting the bread in. To ensure that the bread starts cooking at the desired 200 degrees C you heat the oven a little too hot. That way, when a little heat is lost you have exactly the right temperature. Hope that makes sense! Samology – thank you! The book is amazing – so many more amazing recipes I’ve yet to try . . .
Kiran – you should try it, the potato topping is delicious. A really delicious looking schiacciata. Brava! The story I heard about Tuscan bread not having salt in it is to counterbalance the saltiness of Tuscan prosciutto. But I think your version about the salt tax makes much more sense. How lucky to spend your childhood summers in Italy. I can only imagine your great memories! I’ve never heard of schiacciata, but it looks divine. As you know I’m on a real bread kick at the moment, so this is another bread recipe to try. I especially love your cherry tomato version. Yum! holy smoke! that is one yummy chunk of bread! I’ve made schiacciata before once and it was amazing! 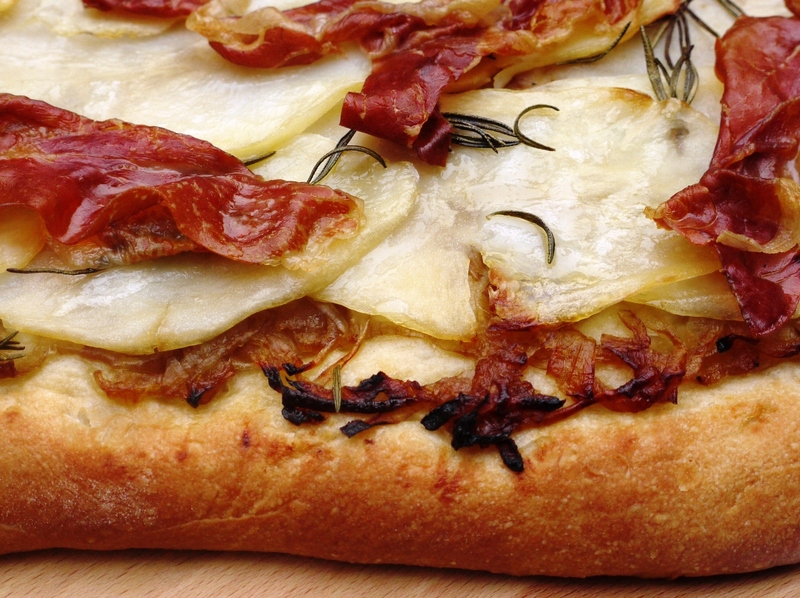 yours looks exceptionally good with the caramelized onions and prosciutto! Nuts About Food – yes, I’ve definitely heard the one about salty prosciutto too… and also that it helps it to keep longer although it always tastes slightly stale after about a day to me! Yummy Supper – my pleasure, hope you bake – and enjoy – some schiacciata soon! Jennifer – definitely do give it a go. I know you don’t eat meat but just potato and onion would be delicious without the prosciutto too – you might need to add a little sprinkling of salt though. Elaina – haha, a fellow bread monster!